The Mile One Market Traders Association (MOTA), has appealed to the Rivers State Governor, Rt. Hon. Chibuike Amaechi to remember his promise made to traders in the allocation of the new Mile One market. In their resolution at the end of a meeting at the Rumuwoji Hall (Ojukwu field) in Port Harcourt, the traders posited that the recent advertorial by the committee on Mile One market, requesting the general public to obtain form for allocation, when traders on ground at the market are yet to be resettled, potends danger. Traders alleged that Governor Amaechi had before now given firm promise to them that their stalls will get back to them after the building is completed, but wondered why the committee is coming up with the new proposal without saying anything about the existing traders. They, However, appealed to the governor to protect the interest of traders, as he has earlier promised, and also expressed confidence in the present administration’s ability to protect the interest of the masses, stressing that Mile One traders will not in any means go into confrontation with government. Earlier in his opening address to members at the meeting, the chairman of the association, Mr. Daniel Iheme, cautioned members of the association who make unguided statements to the public concerning issues of Mile One market without verifying from the executive committee to desist from such act. 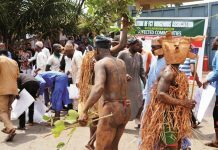 The chairman said that the number of shops, including the table traders that government relocated temporarily to Cultural Centre and Ojukwu field are 1,304 shades, comprising of 654 at Cultural Centre and 650 at Ojukwu field. He said that the commissioner for urban development had asked him to forward the list of traders at both Rumuwoji field and Cultural Centre, pointing out that government have been fair to them, and that they will not have problem with this administration. The meeting hall, which was filled to capacity, as well as the members of the present executive, also witnessed the presence of former chairman of the association, Chief Nathan Emesiobi.